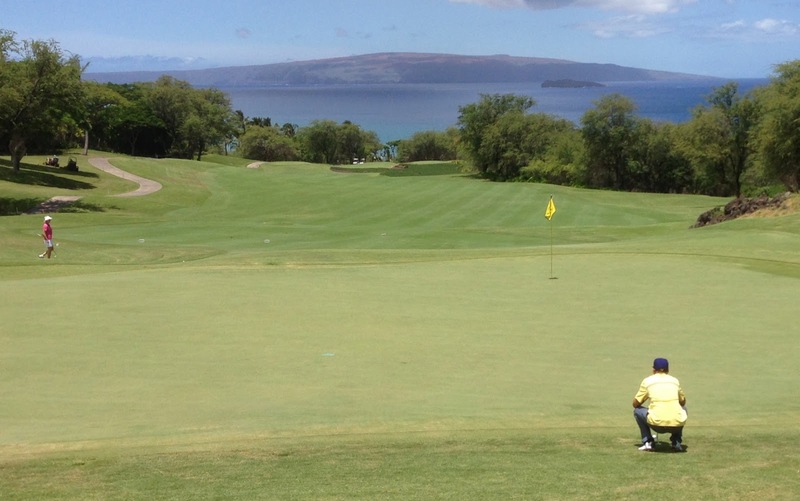 Since the beginning of the trip, we have talked about playing golf at least once while we were on Maui. Jack and Sharon looked through the books and eventually settled on the Wailea Emerald Course on South Maui. This was about a 35 minute drive from our hotel. As an aside, Jack named Maui as "the island of much driving." The hotel was about 45 minutes from the airport. The trip around Hana was a 12 hour all day drive. One of the things that I found odd about the Hawaiian Islands was the speed limits. It seemed like the speed limits were very low everywhere compared to the mainland. We took off early and got there about 9:00 am for a 10:59 am tee time. Sharon spent some time playing an outfit in the pro shop and buying Jack some golf shoes. From there, we headed to the driving range. Jack struggled from the minute he stepped on the driving range. He has not played in a year. I wouldn't let him play during baseball season. Unfortunately, Jack got worse once we got on the course. Jack melted down in Wallenesque fashion... Both Sharon and I felt bad for him; he had been looking forward to playing so much. In spite of Jack's struggles, I had a nice round and really enjoyed the course. Using a nice set of rental clubs, I was consistent off the tee. I shoot a liberally scored 53 on the front nine and a 58 on the back nine. I got a birdie on one of the short par threes on the back nine; I hit a pin high 8 iron to within 9 feet and then sank the putt. Sharon putted extremely well and had a nice round. It was a fairly quick round. We finished playing in about 4 hours 30 minutes. After getting cleaned up back at the hotel, Sharon and I had a drink at the bar and got some food to take to Jack in the room. While Jack crashed in the room, Sharon and I went to dinner at Roy's. This turned out to be one of the nicest dinners that we had on the trip. I had scallops and risotto, while Sharon had monchong again.